There has been much talk over the last couple of months regarding Apple’s next tablet offering, in particular whether it will finally pack an uber-sharp Retina display. 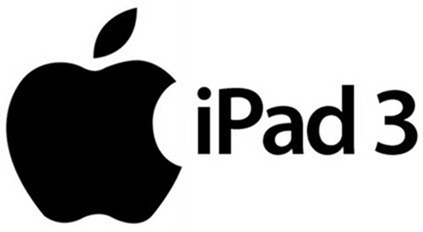 To some, it’s been long overdue, and when the iPad 2 arrived last March, many consumers were left disappointed by the lack of LCD improvement, worsened still by the fact that most had become accustomed to the crisp visuals of the iPhone 4. There have been many alleged leaks of the new display, but most came from unreputable sources and didn’t come with any form of verification. 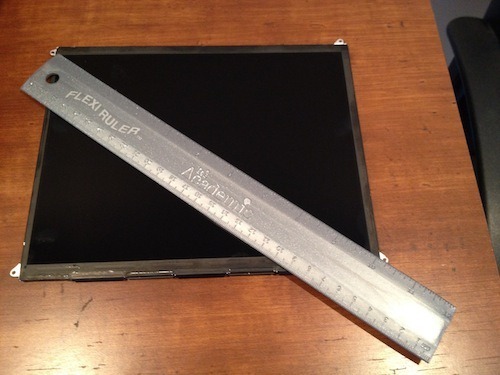 Now, though, MacRumors has gotten hold of a real iPad 3 screen and placed it under scrutiny by means of a microscope. As you’d expect, it’s physically similar to the iPad 2’s screen, measuring in at 9.7" and looks exactly the same to the naked eye. 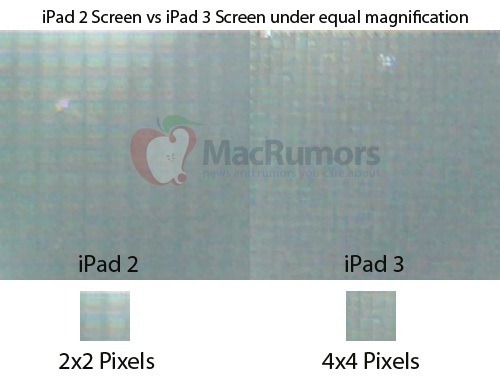 But after taking a closer look, MacRumors has confirmed the pixels are one quarter the size of the current offering. Since MacRumors only obtained the screen itself, there was no way of firing it up, thus taking photos of the new screen proved neigh-on impossible. Even so, we regard MacRumors as a more than reliable outlet, and reporter Eric Slivka noted that even under basic lighting, one can make out the pixel improvement on the display, manufactured by Sharp. The above diagram depicts a small (2×2) snippet of pixels from the iPad 2, compared with the same area on the new display and, as you can see, the resolution is doubled in each direction (4×4), meaning the total number of pixels on the iPad 3 will quadruple, boasting a 2048×1536 resolution. Of course, with the Retina display now a cert, attention will turn to other features – namely the camera – which will almost certainly be improved to compliment the new display. Speculation and leaks have suggested either the iPhone 4 or iPhone 4S camera will be used, but even if this doesn’t turn out to be the case, one would presume the fruit company will lend its tablet users a real reason to frequent the many image social networks floating around. The announcement is expected on March 7th – just three weeks’ time, and I’m sure you – like us – cannot wait for the grand unveiling!